I know what you're thinking... sunscreen? I don't need that, I want to tan. Well, guess what? Even if you tan, you're still exposing yourself to UV rays and damaging your skin. Every time you expose you're skin to the sun, you're increasing your risk not only for skin cancer, but sun spots, wrinkles, and so much more. Why speed up the process, right? So this spring break, wear sunscreen. Even if it's cloudy, you can still burn. The Skin Cancer Foundation recommends you wear sunscreen with at least SPF 15 and broad spectrum. Broad spectrum means it protects your skin from UVA rays and UVB rays. UVA rays are more damaging because they can penetrate through layers of the skin more deeply than UVB. Picking what type of sunscreen is a preference and depends on what activities you're doing. Since I hate rubbing in lotion, I like the sprays because they are faster and easier to apply. I don't plan on getting in the ocean, so I did not pick a sunscreen suitable for wet skin, although, those are ideal for those who plan to. I really like Neutrogena Ultra Sheer Body Mist Sunscreen Broad Spectrum SPF 70 because its easy, refreshing, and not greasy at all. I think Neautrogena is a great company for choosing sunscreens because they have a ton of options. All of my life I have been extremely fair skinned. Growing up it always bugged me, but now I realize how much damage the suns UV rays can cause. Self tanning is a much better way to safely get a tan that will also last longer! For women on a budget, I recommend Jergens Natural Glow Daily Moisturizer. I know some people may have tried Jergens before and hated it because of the horrible odor the DHA caused in their lotions but they fixed it! Jergens now has no odor and their lotion now has a tropical, florally scent. 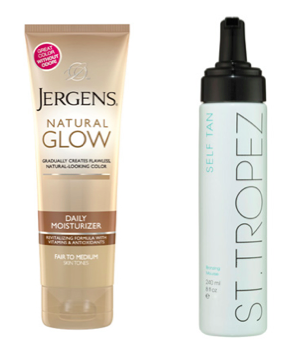 Jergens also has the self tanner in a foam form which is good because it dries really fast, but when I used it it was very streaky. This self tanner has been awarded in by Allure Magazine every year since 2005. Jergens comes in fair to medium and medium to dark tones. I recommend starting with fair to medium to build up but if I want to get dark I have to go for the medium to dark because the light to medium gives you a glow rather than a tan. If you are willing to spend a bit more money, St Tropez Self Tan Bronzing Moose is really great. I've gotten spray tans before and I would say this is just as great as an air brushed tan. It has odor blocking technology and color guard so no odor or mistakes! Since its a moose rather than a lotion, you have to work fast applying it and make sure u apply it with a mitt. If you use your hands you are going to have a hard time taking the tanner off your palms, which screams fake bake. Before applying self tanner, always exfoliate, moisturize, and work your way from the bottom to the top so you don't create lines or streaks. When self tanning, don't neglect the face. If your on a budget, Jergens Glow Face Daily Moisturizer is good for the price. I have slightly oily/ acne prone skin and it does not break me out. 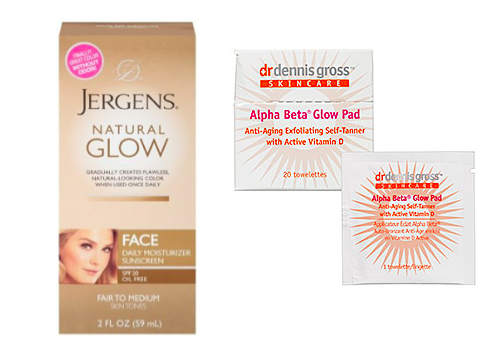 If you are winning to spend more $$, then the Dr. Dennis Gross Alpha Beta Glow Pads are great. The pads not only are self tanning, but also it's exfoliating. I picked up these because I figured exfoliation will help me with my acne scars. I was a little worried trying this product since they were pads, but it looked completely natural and didn't streak at all. I believe all skin types can use this and are ideal for mature skin. Having good hair day on the beach can be tricky especially with all the wind and salty water. My biggest advice for you for not just being at the beach, but also in the summer time, is to work with your natural texture. You don't want to look high-maintenance in a low-maintenance setting, but you definitely don't want to look like you just rolled out of bed. I personally have straight hair and my biggest concern is frizz, so i make sure I use an anti-frizz serum. 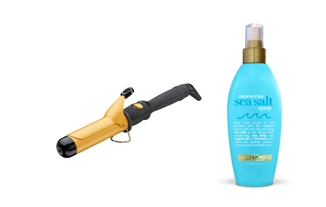 If I want to go for the "beach wave" look, then I will sleep in a braid, then spritz with beach spray. If I want to look a tad bit more polished, then I will curl my hair with a 1.5" barrel curling iron, but not curl every inch of my hair. I'll start mid way of the section of the hair and I don't curl the ends. Then, I'll separate with my fingers and spritz with beach spray. I used the OGX Moroccan Sea Salt Spray. It wasn't the best spray I've ever tried, because I haven't tried many but ut it was cheap and still gave the piecey look. I will definitely be trying more before summer begins. Face: No matter what skin type, you do not need a full face of makeup at the beach. I definitely have some imperfections on my face, so I like lightweight BB or CC creams. Garnier Skin Renew Miracle Skin Perfecter BB Cream for combination/oily skin. I really loved the texture, coverage, and the fact that it had SPF 20. The only thing I was totally bummed about was the color. I tried the light/medium and it was still to dark and orange for me. Unfortunately, I'm just extremely fair skinned. If you aren't fair skinned then this product is great! I tried Mary Kay CC Cream and was pleasantly surprised. I was a little skeptical about this product because it's for all skin types, but it was actually really nice. If you're oily, just make sure you set with powder. My only concern was, once again, the color I chose. I got a little too confident about my future self tanning plans and chose light/medium color, but it was still too dark for me. It does not have as much coverage as Garnier because it is a CC Cream, not a BB Cream. Garnier or Mary Kay are not only great for beach days, but also under your makeup to skip extra steps! One BB Cream I'm DYING to try is the Jane Iredale 'Glow Time' Full Coverage Mineral BB Cream. I've been up full coverage BB creams that seems like forever now, and this is the only product that has shown up. Also, judging by the pictures of reviewers, it seems like it would still be a great buy. The only reason why I didn't buy it was because I felt uneasy about dropping $48 on BB cream. But before summer, I will give it a try to review. For the eyes, I love Garnier Skin Renew Anti-Dark Circle Eye Roller because it's a depuffer and has a touch of concealer in it. Genetically, I have massive dark circles, so when I use this product it doesn't totally get rid of them, but it definitely helps and doesn't look cakey on the beach. I recommend to anyone! Blush: This step is totally optional. I usually get enough color in my cheeks from being outside, but if your one of those people who doesn't then choose a matte blush. Blushes with shimmer or glitter may seem appealing to get "dewy/ glow" look, but it honestly just looks unnatural and unnecessary for a low key beach day. Eyes: In my opinion, tightening up your brows is one of the easiest ways to frame the face without having to do a whole lot. So pencil, comb, and set with Maybelline Great Lash Clear Mascara for Lashes and Brows. Once again, this step is optional. I have naturally blonde lashes, so if I don't have any mascara on you can't really see them. I usually just put one coat of brown mascara to open my eyes naturally. If you have dark lashes, curl them and call it a day. Whatever you do... don't make your lashes look like spider legs! To avoid this, try to stick with one coat of mascara. Lips: Other than sunscreen and picking out a swim suit, this is a step you cannot neglect. Just like the rest of your body, your lips can easily get burned and sometimes forgettable. Find any lip balm with SPF and that should do the trick. If you don't have any natural color to your lips, Neutrogena Revitalizing Lip Balm SPF 20 is a great option because not only does it moisturize and contains SPF, but it gives the lips a natural hint of color. Thanks so much for reading! Everyone have a safe and fabulous Spring Break! Leave me comments for feedback.